It always takes me by surprise when this holiday rolls around. Perhaps it’s lost some of its novelty and doesn’t make as much of a splash as it used to? 27a. 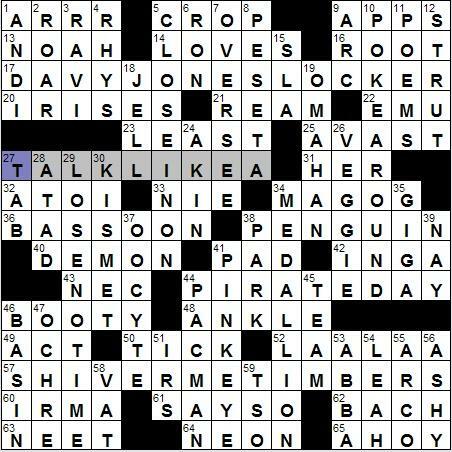 [With 44-Across, annual celebration on 9/19] TALK LIKE A | PIRATE DAY. 1a. 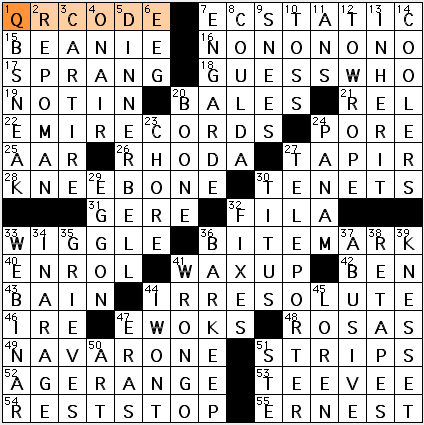 [Common interjection on 27-/44-Across] ARRR! I tell you, when I see a clue like that at one across, my heart sinks a skooch and I know to expect at least an additional minute in my solve time. Grrr! 17a. [Where plank-walkers end up on 27-/44-Across] DAVY JONES’ LOCKER. 25a. [“Hold it!,” on 27-/44-Across] AVAST. I’m already bored of typing the unsavory “27-/44-” I hope it doesn’t float around in my dreams tonight. 46a. 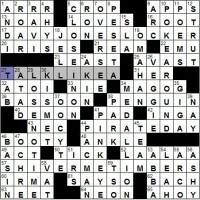 [Treasure on 27-/44-Across] BOOTY. ATOI and NIE, not absolutely top-tier foreign vocabulary, back-to-back. Crossword mainstays actress INGA Swenson and film “IRMA La Duce”. [1970s radical org.] SLA, the Symbionese Liberation Army. Long non-theme fill! 10-letter POKE AROUND and LOSE NO TIME, 9-letter CLOSE IN ON and MEDALLION. Birds! STRUTting peacocks, EMU, PENGUIN. The Bibble! NOAH, MAGOG (not Magrog, alas), LAA-LAA, and LEAH. Row 11: BOOTY ANKLE … ANKLE BOOTY … ankle boot! Column 7: OVERSEE PINKEYE is more than a bit unsettling. And with that pleasant thought, I sail off into the sunset. 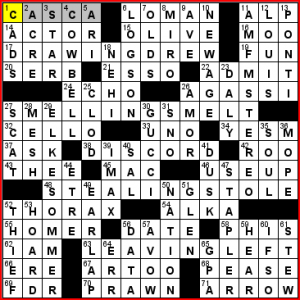 17-Across: “Drawing” is the present progressive tense of “draw” and “drew” is the simple past tense. Put them together and you get DRAWING DREW, which can be described as [Doing a sketch of a teen detective?]. 48-Across: Putting “steal” through the same wringer gives is STEALING STOLE, or [Making off with a mink wrap?]. You can always count on Peterson for interesting long fill. We see AM-FM quite a bit, but here we get the full AM-FM STEREO, the [Standard car feature]. Opposite that is ELKE SOMMER, [Paul Newman’s “The Prize” co-star]. Here too we usually see only the first part in crosswords, so the full name is a nice touch (even if Elke Sommer hasn’t been famous since her run on the game show circuit in the late 70s and early 80s). Other good stuff includes COWBELL (we need more cowbell! ), CASCA, and NEW AGE. My unknowns were [Italian film producer Carlo] PONTI and EARLAP, the [Winter cap feature] that I always want to be EARFLAP. I’ve become sufficiently tech-savvy to the point that I read [Item on a desktop] to mean something on my computer home screen, so I was frustrated that ICON was too short and PROGRAM didn’t seem to work. Of course, on an actual desktop, a STAPLER would indeed be a common enough sight. I like “NO, NO, NO, NO.” I usually stop at three when I’m writing a string of “no”s, but out loud? There’s no limit. REPO MAN is always nice to see, and I like that the clue makes no mention of that recent remake. DINNER BELL evokes the song by They Might Be Giants, so I like that. WEBINAR is such an ugly word, I like to see it in the crossword. “WRONGO” is cute and echoes “NO, NO, NO, NO.” And COULDA is fun. The clue for TENETS is good for a smile: [Missionary positions]. I didn’t know there was another famous RHODA besides ’70s TV’s Rhoda Morgenstern, but here’s a video of “hard bop and soul jazz organist” Rhoda Scott playing with two other women on trombone and drums. Good stuff. I hadn’t known that the Hammond organ worked as a jazz instrument. Go have a listen. [Gets into the pole position?] as a clue for STRIPS. Not as showy as your usual BEQ 68-worder. 3.25 stars. There’s no Across Lite version of this puzzle posted yet, so I resorted to the applet on the L.A. Times website. My first attempt to use the left mouse button to change directions led to the grid zooming in. Yikes! Zoom out! Zoom out! It’s a Monday-easy puzzle, but the interface I’m not used to made it take me a Wednesdayish amount of time. 17a. [“No holds barred!”] = LET IT ALL HANG OUT. 22a. [Where there’s gold, in prospector-speak] = THEM THAR HILLS. I love this. Why isn’t there a Talk Like a Prospector Day? 38a. [Swallow one’s pride] = EAT CROW. 53a. [Worker with icing and sprinkles] = CAKE DECORATOR. 60a. 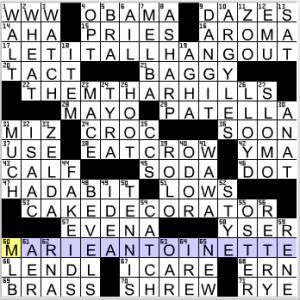 [Ruler to whom the quote formed by the starts of 17-, 22-, 38- and 53-Across is often attributed] = MARIE ANTOINETTE. Solid Monday puzzle with colorful theme answers hiding that quote. Four stars. This entry was posted in Daily Puzzles and tagged Brendan Emmett Quigley, Doug Peterson, Jeff Chen, Julian Lim. Bookmark the permalink. Alas, me hearties, I’d no idearrr LAA-LAA was in the Bible. It be a fine puzzle, quite the ruckas. I give it an Arrrr rating. First LA Times theme answer made me think of http://www.youtube.com/watch?v=bGGMPQtK71o. Their 10 Down should have been ARRGYLES! Kluge, I actually understood every word of that.